We took a look at the world’s top 100 brands to determine which fonts, colors and formats were the most popular choices. Our infographic provides some good food for thought if you’ve hit a road block on your latest logo design. Infographic authored by TastyPlacement, <a href="https://tastyplacement.com/">an Austin SEO and web design agency</a>. To view the original post, <a href="https://tastyplacement.com/infographic-fonts-colors-logos">click here</a>. We based our research on the latest Forbes list of the world’s most powerful brands. Since brands frequently change or update their logos, our study reflects only the logos featured on the list. The color white was not included as a design feature if other colors were present. Apple’s white logo was the only exception. We found that most brands opt for a blue logo featuring the world’s most popular sans-serif font, Helvetica. Serif fonts ended up being the least used typeface, although it hasn’t stopped Google from being listed as the #5 top brand in the world. 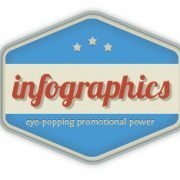 Want an Infographic for Your Site? Check out our Infographic Development services and see what TastyPlacement can do for you! Michael David is the founder, current CEO, and lead strategist at TastyPlacement, based in Austin, Texas. He is the author of “WordPress 3.0 Search Engine Optimization” with the prestigious IT publisher, Packt Publishing. TastyPlacement performs search marketing campaigns, public relations, search engine optimization, social media consulting and online advertising for companies in a wide range of fields. Another epic infographic. Makes me wonder how much something like logo color impacts website conversion rates.. Superb. But I wonder if the companies who use “logo only” also attach an audio with their ads or somehow bring the consumer another sensory perception as to obtaining their brand name. Was definitely surprised by “Blue” but blue is so generic. There are a million shades of blue nowadays. Is there any particular blue that is prominent? I thought the winner would be red! Anyway, nice little infographic. Thanks for the data! Blue is so popular because it conveys trustworthiness. This post caused me to revisit my branding portfolio at http://getlucid.net/portfolio/branding/ to see how much blue I was unconsciously using. Turns out, blue is in the majority of the logo examples there. I think it’s a great idea, but very inaccurate. UPS is Brown, “What can Brown do for you”, Verizon is red, Disney is blue, and I doubt Hyundai and Dell can be considered a top brand. Awesome infographic design. Really a creative one.